Why are African militaries not making better use of CubeSats? This article originally appeared in the June edition of SA Flyer and FlightCom magazine. It is republished here with minor edits. As the cost of space-based sensors continues to plummet, most African militaries remain surprisingly uninterested in using the technology and reaping the benefits that their counterparts in the rest of the world are experiencing. This represents a missed opportunity that may have dire effects for the effectiveness of the continent’s national armed forces in the medium future. 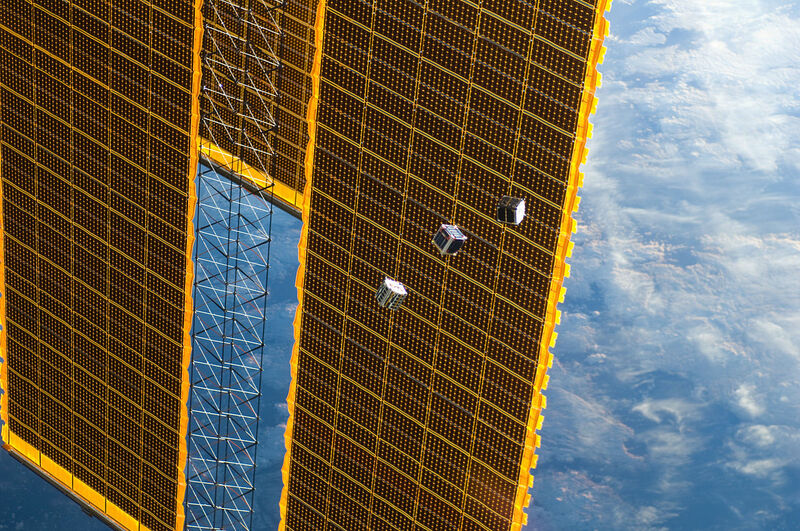 Several tiny CubeSat satellites are shown in this image photographed by an Expedition 33 crew member on the International Space Station on 4 October 2012. By NASA. When most of us hear the word satellite or, worse, spy satellite, one of the first words that comes to mind is ‘expensive’. This is hardly unwarranted, as since the dawn of the satellite age it has required deep pockets to design (or buy) and launch traditional satellites. South Africans recently had experience of this thanks to the mysterious Project *Flute*, a classified project to buy a Russian Kondor-E satellite and have it launched for a cost of over US$ 100 million. With an estimated lifespan of only five years, after which it would have to be replaced, that would appear to put those capabilities beyond the budget of most. But the introduction of nanosatellites has the potential to revolutionise access to space, bringing down the costs of building and launching a basic satellite down by an order of magnitude. Where traditional full-scale satellites cost on average about $50 million to manufacture and at least as much again to launch, a nanosatellite can be built for less than $300 000 and launched as a secondary payload for as little as $40 000. Of course these small satellites could never carry the same size payloads as a full-size satellite, but the ever-shrinking size of high-performance sensors means that it’s now feasible to achieve an acceptable level of capability at a fraction of the price. To explore how these cost savings have become possible, we need to look at the CubeSat specification and its commodisation of nanosatellite hardware. In 1999, two professors at California Polytechnic State University (Cal Poly) and Stanford University developed a common set of standards for small satellites in order to allow universities to develop research spacecraft much more quickly and cheaply than before. Their realisation was that even when universities worked on smaller and cheaper satellites, the launch costs remained high because each satellite had to be carefully designed to match the highly complex launcher interfaces of whichever rocket they would launch on. In the event that the original launch vehicle was no longer available, they’d have to embark on a costly redesign of their satellite hardware interfaces to match those of the new launch vehicle. So the CubeSat Design Specification defined the base CubeSat, referred to as ‘1U’ or ‘1 Unit” as being a satellite 10cm x 10cm x 10cm, weighing no more than 1kg and having standard interfacing and attachment points on the outer shell. It’s supplemented by a standard in-orbit deployer, the Poly Pico-satellite Orbital Deployer (P-POD), which is effectively a rectangular prism with space for three 1U CubeSats (or a combination of 1U, 2U or 3U CubeSats) and a big spring at the back to push them out once the host launch vehicle sends the command. As a builder of a CubeSat, all you need to ensure is that your satellite matches the specification. If it does, it can be flown on any launch vehicle that can carry the P-POD deployer, a list that at the time of writing includes the Atlas V, Delta II, Delta IV, Ariane V, Falcon 9, Taurus XL, PSLV, Dnepr, Antares, Kosmos and more. What’s more, it allows for up to a dozen CubeSats to be launched on a single flight, bringing down the launch costs even further, and in February an astonishing 33 were launched from the International Space Station, having come up on the regular resupply flights. The Design Specification and P-POD are what allows for the most remarkable aspect of the CubeSat design, the ability to connect multiple 1U CubeSats together to create larger and more capable satellites without any change to the launch vehicle or deployer. These CubeSats are named according to how many base units they’re equal to, with two units being a 2U CubeSat, three being a 3U and so on. There are even proposals for a 20U or bigger CubeSat, assembled in orbit, capable of mounting optics 20cm in diameter. It’s this combination of low cost, rapid development and the ability to connect CubeSats together that caused the popularity of the specification to soar, with over 75 CubeSats launched to date. While some are still projects by universities, including the TshepisoSat (ZACUBE-1) space weather monitoring satellite built by Cape Peninsula University of Technology (CPUT) students and launched earlier this year, most of the adoption is now coming from commercial companies and militaries eager to explore ideas and concepts that would be too costly with traditional satellites. The fact that it’s possible to build a small constellation of CubeSats for the same cost as a single traditional satellite has opened up tons of potential applications. Of most relevance to this column is the research that the US military and its partners are doing on the use of CubeSats for military applications. One of these is the US Army’s SMDC-ONE (Space and Missile Defence Command – Operational Nanosatellite Effect) programme, which consists of 8 test CubeSats and proved the ability to create a cheap constellation of satellites that could provide real-time voice, text and data message relay between Army units deployed in a combat area, without first having to go through a relay station. The US Army also has another nanosatellite programme called Kestrel Eye, which although not manufacturered according to the CubeSat specification, is a fleet of 30 small nanosatellites that are able to provide continuous 1.5m resolution satellite imagery of the operational theatre, downlinking the images directly to soldiers on the ground who would even be able to task the satellites directly from the ground. The US Air Force has, for its part, launched CubeSats from Boeing to monitor space weather and set up its own internal CubeSat programme to further understand how they can use the technology, while the National Reconnaissance Office is using CubeSats for Space Environment Monitoring missions. With the above in mind, the CubeSat specification provides African militaries with the opportunity to acquire capabilities within their existing budgets that would have been completely out of reach just a short while ago. Most countries would be able to afford a small fleet of imaging satellites of adequate resolution for most needs and larger militaries, like those of South Africa and Nigeria, may be able to afford small constellations of communications satellites and imaging satellites able to provide timely and regular imagery of areas in which their troops operate. Such constellations would be a major enhancement to the continent’s peacekeeping operations and its ability to head off and defuse humanitarian catastrophes like that seen in the Central African Republic. First, line-of-sight radio communications remain a huge issue for peacekeeping missions, especially in larger countries like the DRC. The Force Intervention Brigade’s HQ in the eastern DRC was frequently out of direct radio contact with its deployed companies many times in the past few months, needing to rely on verbal relays from other MONUSCO forces in the area. Going further back, units have sometimes been completely out of radio contact during certain parts of operations, making it impossible to call for reinforcements of exfiltration. Using commercial satellite communications such as that provided by Iridium is too expensive for wide-scale use, so it tends not to be used. But a small constellation of CubeSats could provide not only persistent affordable satellite communications to the peacekeeping mission, but also from the troops to their countries of origin and to the UN. This would also allow armies to deploy and use datalink-based command and control (C2) systems, like the South African Army’s Chaka/Legend system, on long-distance missions. Secondly, the value of space-based imaging is first in the ability to take photos, second in the ability to get those photos in the hands of those who need it fast, third in the ability to compare the differences between images of the same area taken on different days and only fourth in the ability to have very high resolution images. So while there will always be a need to purchase high-resolution imagery from commercial operators, a small CubeSat constellation fitted with 1.5m resolution multispectral cameras would be able to fulfill the three most important needs of a space-based imaging system. Not only would this have immense direct military value in allowing for enemy or rebel forces to be monitored and mapped, but it would have a secondary benefit of allowing militaries to keep track of humanitarian disasters, of instances where the population in an operational area is being punished or coerced by rebel forces and of being able to provide better geospatial intelligence to the soldiers on the ground. The ability to use algorithms to compare subsequent satellite imagery of the same area and only alert operators when a significant change is detected makes this all much easier to achieve and operate. Of course, it’s still optimistic to expect all but the continent’s most powerful militaries to be able to even consider operating more than a handful of CubeSats at most, especially as the satellites will require replacement every 2-5 years and will need a significant investment in ground-based telemetry and receiving stations that only South Africa and Nigeria really possess at present. So there is value in looking at the potential for establishing an AU-managed agency for the use of CubeSats for continental missions, along the same lines of the proposed microsatellite-based African Resource Management (ARM) constellation. If designed to a common standard and able to seamlessly host nation-specific encryption, such a constellation could make the above-mentioned capabilities available to most armed forces on the continent for a relatively low cost, while also deepening inter-military scientific and technological co-operation. However it develops, the time for African militaries to establish CubeSat and other nanosatellite research labs is now.